The New York City Department of Transportation is helping restaurants turn parking spots into table space to make room for customers. 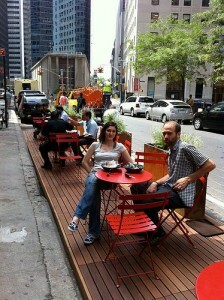 A two-year pilot program, announced by the NYCDOT, allows restaurants to create pop-up cafés in curbside parking lanes where the sidewalks are too narrow for traditional outdoor seating. The program follows this summer’s first pop-up café on Pearl Street which saw a row of parked cars replaced with planters, bamboo decking, tables and chairs, modeled on San Francisco’s Pavement to Parks program program which allows for six-month trial parking spot takeovers. The two restaurants that paid for the Pearl Street project reported that the new public café space brought in more business, plus “some beauty to the street. Normally, it was just commercial trucks out front.” NYCDOT hopes to replicate this success across the city by partnering with restaurants and cafés in up to 12 locations throughout the five boroughs. The pop-up café program is a good example of how New York City’s street space can be reclaimed to benefit businesses and the public, the majority of whom don’t drive or depend on cheap on-street parking.